Each season the villagers will gather together to celebrate. These days will be marked on your calendar inside your house with a star, and on the day of the festival you'll see "FESTIVAL" next to the current time. Festivals take place at Flower Bud Square and the entranceway is even decorated. Some of the festivals require you to donate the supplies needed for the party. On the day before the celebration, toss whatever item is required into the shipping box in the Square. If you don't put in the effort then the festival won't take place! If the festival is a simple gathering, the event will be over after you have finished talking with all of the villagers who are attending. You can't celebrate this event until your 2nd year, since you start your life in Flower Bud Village on the 2nd of Spring. Everyone gets together at the Square for some happy drinks to bring in the new year. This festival is about the mighty egg, and what kind of food dishes can be created with it as an ingredient. It's unlikely you'll have any egg dishes to use as supplies on your first year, but Carl and Jamie will donate the needed ingredients. After that you'll have to do the work yourself. You probably won't be able to participate in your first year, but it will be the chance you get to see Dan, Duke, Gwen, and Doug for the first time. There are 4 different races you can enter, but only if you own your own horse! You'll need a well trained horse to win first place and you can only enter a horse in one of the races. 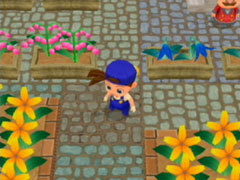 The day before on the 22nd, drop off a flower into the blue shipping box in Flower Bud Square. The next day the entire area will be filled with various colored blooms. If it's the first time you're participating then you will meet with Lyla. If you don't do this your first year then you'll have to wait an entire year until you can see her! If you have a cow you can enter it into the judging festival. Talk to Theodore to select a cow from your farm. If you win you'll earn a musical note. Head to Moonlight Beach between 6:00 am and 6:00 pm. The beach is in the southwest corner of the world, near Tai's Blacksmith Shop. After you talk to everybody you can participate in the swimming mini game. You need to press the A button to swim and tag each one of the 4 colored buoys. Whoever tags all of them first is the winner, and you have to wait for everyone to reach the colored balls before the game is over. If it's your first Beach Festival then you'll meet Nami, the weather girl. She will be at the Perch Inn during the summer season. 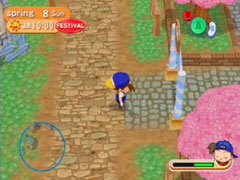 Besides getting a Music Note for participating, the winner of the game will receive one of the rare Power Berries. The person with the highest affection will greet you in the morning and ask if you would like to sail a bamboo boat with him/her. If you agree, meet with the person in F.B. Square after 6:00 pm. The two of you will make a wish and sail it off down the river. The event ends at midnight. On the day before make sure you get a Moonstone from the Moonlight Mine and toss it into the Flower Bud Square drop box. To participate in the festival to honor your ancestors, just head to the Moonlight Beach between 6:00 am and midnight. You don't have to donate any supplies for this event. 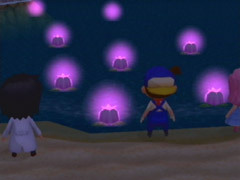 Just show up at Moonlight Beach before midnight and the villager who likes you the most will stand with you to watch the fireworks in the sky. If it's the first time your attending the festival then you'll meet Louis. After 9:00 am, talk to Theodore in the Square. He'll allow you to select a sheep from your farm to enter into the contest. Your sheep can not be sick and it also has to have all of her wool intact. The marriage candidate with the highest affection will greet you at your front door in the morning and invite you to watch the moon with him or her. If you agree, meet in the Square. The two of you will head up to Starry Hill to watch the moon, and maybe even get a little kiss. Just like with the Spring Race, you can enter up to 4 horses for a chance to win prizes. The day before, make sure you put a crop you've grown inside of the shipping bin in Flower Bud Square. The next day head to the Square and you'll see the Harvest Festival. Gourmet will be there to give you a new cooking recipe like Truffle Saute. 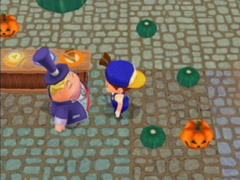 Make sure you've shipped a Pumpkin to the Square shipbox the day before, then go to the Square on the 30th. If it's the first time you're attending then Theodore will reward you with a Power Berry for all of your hard work. Theodore will let you select a chicken from your farm to enter into the judging contest. Then talk to all of the villagers in attendance in order to start the judging. This isn't a holiday that happens in the Square, but rather a cake giving day for everyone who lives in the village. If you have raised a person up to 3 or more hearts, when you talk to that person he or she might share some cake with you. You can give the cake to another person or even ship it for about 800 G. On this day you can even give Jamie some cake if you want to see Jamie blush. On the day before, you are required to place a Stake in the Square box. Don't worry about using one of your own. Just take a piece of fencing from the neighbors! The next day meet at the Moonlight Beach to guard a fire for those who have died at sea. The person who guards the flames with you will be the bachelor or bachelorette who has the highest affection towards you, regardless of your gender. The marriage candidate with the highest affection for you will greet you at your front door in the morning and ask if you would like to go view the stars that evening. If you do, meet him or her at the Square. The two of you will head up to Starry Hill to view the heavens. If you have at least 4 hearts with that person you might get a kiss. In the morning you'll be greeted by Carlos, Arthur, and Billy. They are going to send a secret invitation to someone, inviting that person to watch the new years sunrise with you. The Sprites give you a list of your top 3 marriage candidates and you pick the one you want. When you're ready to participate, head to the Square to meet with your date. You will head off to Starry Hill to contemplate the new year.